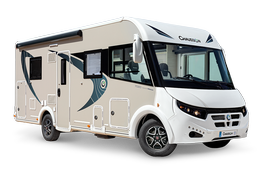 Accessible from a special outside door, the Technibox provides a single place for all the essential controls that ensure proper operation of your motorhome. 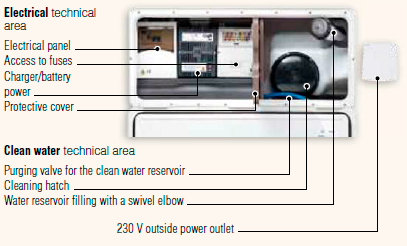 the electricity area gives you access to the electrical panel: no more contortions when you change a fuse! easily clean the reservoir for maximum hygiene. This compartment has a tray for collecting spilled water; water won’t stagnate in the compartment and drains outthrough the opening designed for this purpose. 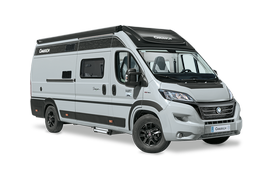 The Technibox is standard on all our overcabs and low profiles except for model 620.
motorhomes have a 30 mA differential circuit breaker as a standard feature. In contrast to a traditional circuit breaker that protects equipment, the differential circuit breaker also protects people. It will automatically shut off the current if it detects a loss of current corresponding to defective insulation. This device thus allows protecting against short circuits and conductor overheating in case of overload.